Yesterday I mentioned a top secret event, today I'm spilling the details... Join me, as we unpack a special delivery straight from Vancouver. Today and today only, shop an exclusive collection from the Lululemon Lab making its first ever US debut. The Lululemon Lab is a unique and inovative section of Lululemon, producing casual day wear, not athletic wear. These designs, are traditionally sold exlusively at the Lab in Vancouver, and are not available online. Chicago is receiving 160 pieces. When Lululemon approached me about this venture I was honored to be included. We all know and love Lululemon's premium & flattering fitnesswear, so when they introduced me to the idea of daywear that reflected these same values, I was beyond excited about the possibilities! The Lululemon Lab is a design concept space for Lululemon established in 2009. Here, Lululemon's in-house design team combines the functional roots of Lululemon's athletic gear with the latest local and international fashion trends to produce an exclusive collection of premium, functional, and on trend designs for everyday wear. This team is dedicated to producing key pieces designed to take you from morning to night - streamlining your wardrobe from commute, to work, to yoga, to dinner. These collections have never been seen in the US, until now. 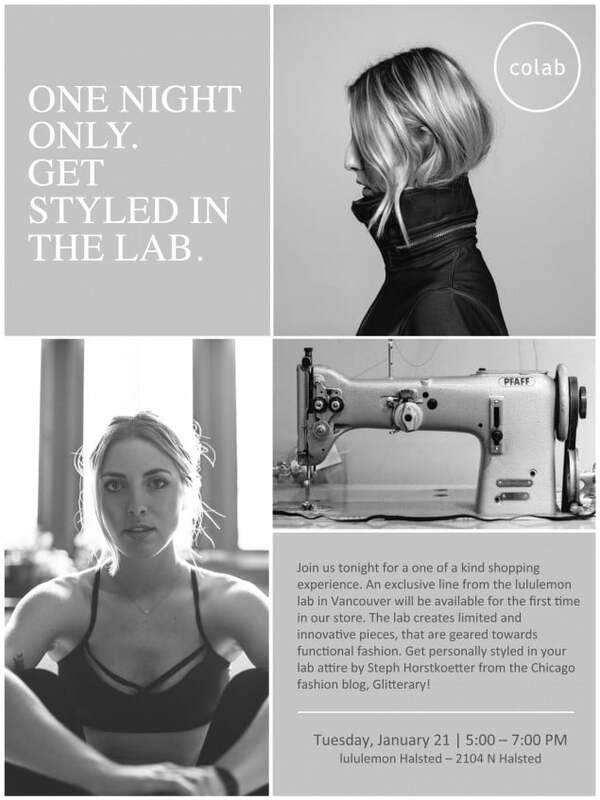 Chicago's Halstad Lululemon location is one of a few select Chicago & New York stores to receive a very limited edition shipment of Lululemon's Lab collection, and tonight I'm helping you style it! I cannot emphasize how much you're going to love this line, and it is extremely limited, so grab your best guy or girlfriend, and join me tonight 5-7pm, at Lululemon's Halsted location (2104 N. Halsted St., Chicago, IL 60614).